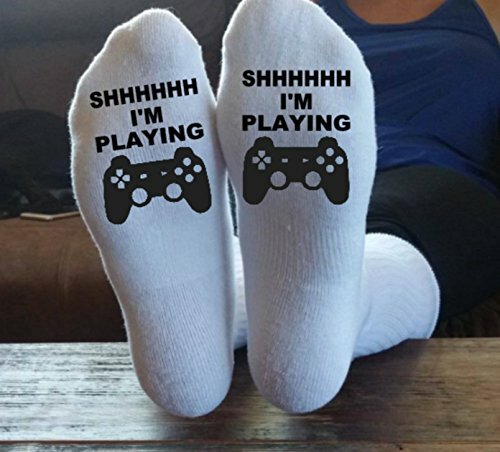 SHHHH I'm Playing, Video Games, XBox, Playstation, PS4, PS3, Xbox One, Online, Gamer, Socks, Gamer Socks, Call Of Duty, Christmas Gift, This sale is for the Game Socks. If you want any design. Message me please. These socks are designed and made in our home in Nevada ( Not Las Vegas) They are made by our family for your family. Every pair is printed by hand and each may have little differences. Each one is custom made to order. We use sublimation printing. The graphic will not crack it will not fade. You cannot feel the print. It is dyed into the fabric. The print will stretch as much as want and it won't crack. You can wash them 100 times the print won't fade. The socks are 95% Polyester and 5% Spandex. They are high quality thick comfortable socks. Message us if you have a design you want put on the socks. We can print almost anything on them. Full color pictures print nice and bright. If you have any questions about this product by Taylored Custom Coatings, contact us by completing and submitting the form below. If you are looking for a specif part number, please include it with your message.